The maker movement is alive, well, and has been very much reinvigorated over the last few years. Makers and tinkerers have been creating amazing projects and supporting each other in a large online community, not all too different from our own Salesforce community. The tail end of 2013 and 2014 brought a wave of "smart" wearable tech - 2015 will be no different (check out some of the ideas on Kickstarter). Adafruit created the CC3000, a Wi-Fi enabled breakout board (also, available as a shield), featuring a Texas Instrument chips that allowed you to add Wi-Fi capabilities to your projects. 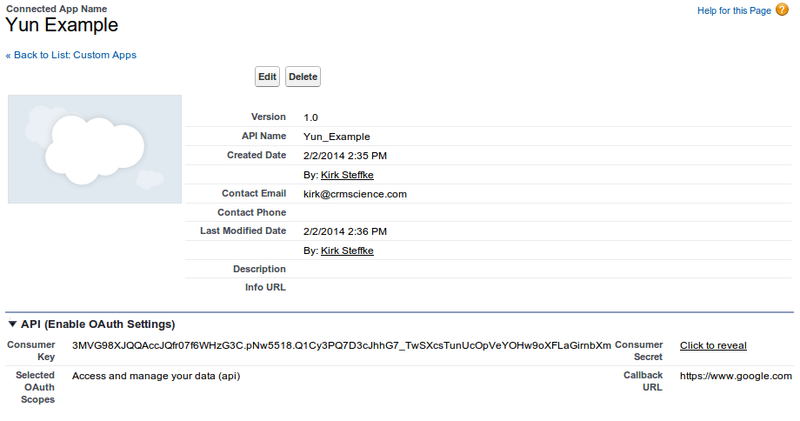 You could now send web requests to servers or even treat your device as a basic web server to receive requests. Then along came the Arduino Yún (Chinese for "cloud", by the way) board - the best of the Arduino you may already know and love with a bridge over to an embedded linux chip. Now you've got more flexibility in you data processing and web handling. You could easily a Raspberry Pi (fairly inexpensive embedded linux board) for the project in this post, but then you lose out on the fun of working with the new Yún. If it were up to me, I'd be saying in my best Oprah voice, "You get a Yún!... and you get a Yún!... and you get a Yún!...) while living in a house made of Yúns - big fan Massimo Banzi, big fan. So what are we going to build? How about a little switch box to help quickly destroy all the evidence? Alright - let's not be destructive, so let's create a few test records via the push of a button. Sure, you could always execute the same script anonymously, but let's be honest, this seems like more fun! How's this going to work? We'll wire together an Arduino Yún and connect to it an LCD and a rotary knob. Users will twist the rotary knob clockwise or couter-clockwise to select an object (Account, Contact, Lead, Opportunity, or Case). The user will then push the knob (hooray, built in switch!) which will send a request across the Yún's bridge to the linux side to kick off a Python script. This script will callout to your Salesforce Org, which will be using an Apex Rest class to kick off the destruction create copious amounts of test data and send back a response to the board. Note: I'm using the LCD Backpack (linked above) that uses 3 wires. The above locations on the LCD are not correct and don't represent the use of the backpack. We'll use a Connected App to provide us with an endpoint to authenticate against so we can securely use our custom Apex Rest classes. Overview: Our sketch is very simple - in a nutshell, when we flipping our final switch runs a Python script. More verbosely, after the Yún board boots, it will be listening for a signal on the switchPin (13). The switchPin will be hot after our final safety toggle is flipped (and illuminated!). 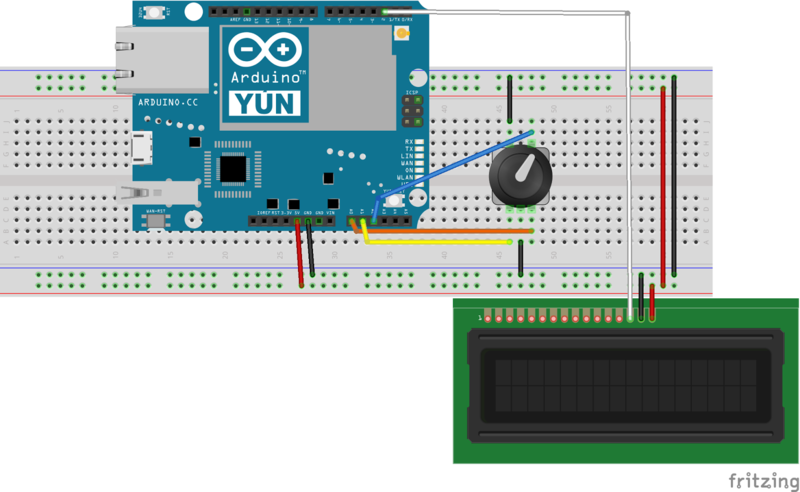 At that moment, we'll use the Yún's bridge from the Arduino side to the linux side to kick off a new Python process to run our script to call out to our Salesforce endpoint. So there you have it - with all those pieces in place, you should be able to twist the knob and cycle through the various sObject types. Within the Apex Class above, we only handle Lead and Account scenarios - but you can just as freely modify all of the code to kick off any Apex code via the webservice class. Likewise, within the Python script, you'll see that it's currently configured to take two parameters, one for the object type and one for the number of records to create. 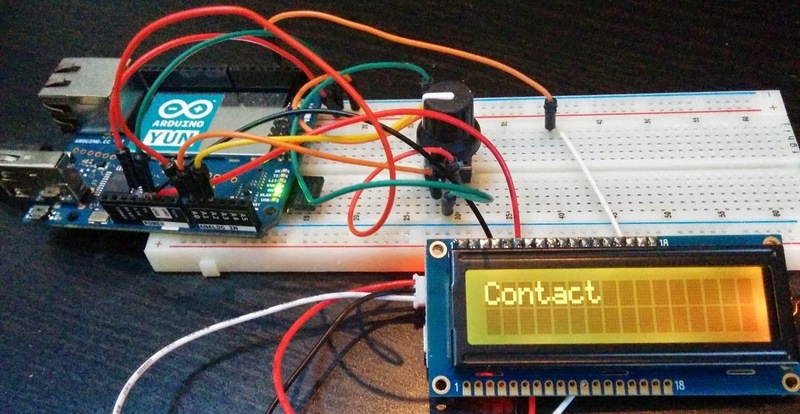 The Arduino sketch can be modified to allow for the selection of an sObject type, then the number of records to create, before sending the request to the web service. Have fun and please share any projects you have in mind or have done!